Ever since we had Kaitlin, it has always been important for me to find products that are as pure as they can be even if it means spending a little more so I'm always on the lookout for products that are honest and fresh. When it comes to milk, there are so many kinds. For babies and kids, they usually drink formula milk. However, Kaitlin has always been used to breast milk so she didn't really accept formula milk when we tried to introduce it to her on various occasions. We even bought different brands, but she still preferred breast milk. So when she turned one, I decided to let her try fresh milk. Having done lots of reading up on the Internet and in books, it's been advised that prior to the age of one, babies should only either drink breast or formula milk. After they turn one, and if you wish to feed them fresh milk, it should be whole cow's milk. This means, not skimmed or low fat. Just pure 100% fresh cow's milk and that's what I've been looking out for. It's always important to read labels. I was surprised to see that many of the milk brands out there claimed to provide all the nutrients the body needs and for stronger bones etc, actually didn't contain just milk, but many other ingredients as well. In the end, I did manage to find a milk brand that had just 100% pure fresh milk. I'm happy with the brand that we've been using and Kaitlin surprisingly loves drinking fresh milk, but I'm still on the lookout and am interested if there are any better brands. Thus, when the opportunity came to review Greenfields' range of milk products, I was more than happy and interested to! To be real honest, we've never tried Greenfields milk before. 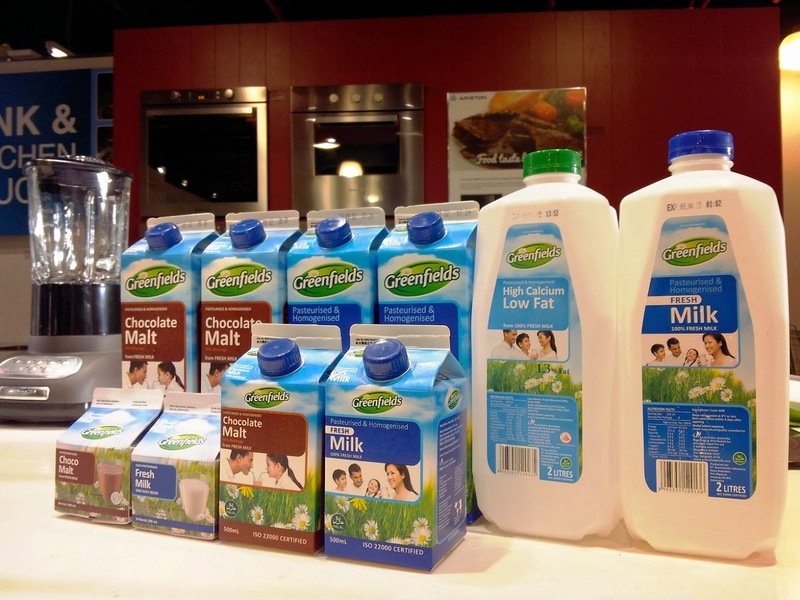 However, the first thing that made me want to try Greenfields' milk was the fact that there are no additives, chemicals, antibiotics and hormones in their fresh milk. Major plus points as this means that it is definitely safe for the whole family! The milk comes from Greenfields' own scientifically-sourced and managed herd and is produced, pasteurized and packed within the dairy based in East Java, Indonesia since it first established in 1997. You can be guaranteed that optimal freshness is ensured as the milk is single-pasteurized and what's more the fact that it is physically closer to Singapore means that it takes only 2-3 days to ship their milk over as compared to milk from Austrailia/NZ which takes 6-7 days. All that sounds great right? 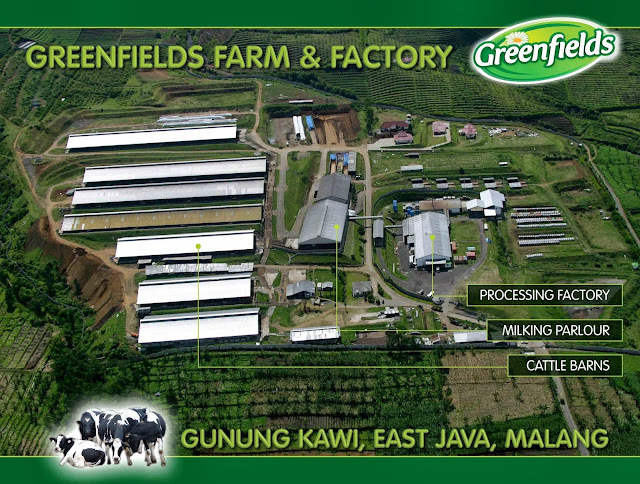 But we have to put Greenfields' milk to the taste test to be sure that it indeed that good. 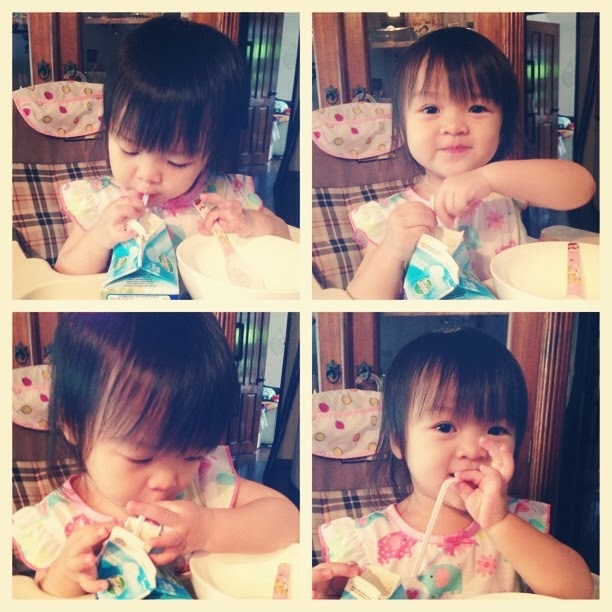 Well, it looks like our food connoisseur (*coughs* ahem fussy eater) loves the milk! To be real honest she didn't finish the entire packet at one go. So we kept it in the fridge with the intention of the rubbish bin (aka Mommy) finishing it at night. Then guess what? During dinner, she asked for milk, which refers to Greenfields milk as we hadn't been giving her any other kinds of milk (formula/other milk brands) these few days. Needless to say, she got really excited about drinking it, which FYI is really rare. So if she likes it, she really really likes it! You'd be thinking what does a kid know? Don't all milk taste the same? Well, I'm here to assure you that we did try the milk ourselves and it does taste like pure fresh milk. Not that we've tasted pure fresh milk before but Daddy Li and I did conclude that it just didn't seem to have the artificial taste. It had a strong milk taste, but not one that was overpowering. The first of the range of Greenfields' milk that I tried was the Chocolate Malt. I used to only drink chocolate milk when I was young cos I hated the taste of fresh milk, so I had to try this as it was different from the other brands which offer Chocolate flavours and I love it! It's definitely different in taste as compared to the usual chocolate flavoured milk that you would usually get. It's not as sweet, but yet still has the "chocolate-y" goodness. Another of my favourite from the range is the Fresh Milk. I'm not into buying the skimmed milk and low fat versions for our family as we share our milk with the little one, but I think it's great for those who are into living a healthy lifestyle but yet want to get the best nutrients they can. Besides just drinking the milk as it is, I also like to use milk when cooking at home. I find it a great way to give whatever I am cooking a milky, creamy taste, or to simply thicken it. It's definitely great for days when I don't have homemade stock on hand to make the dishes more flavourful. 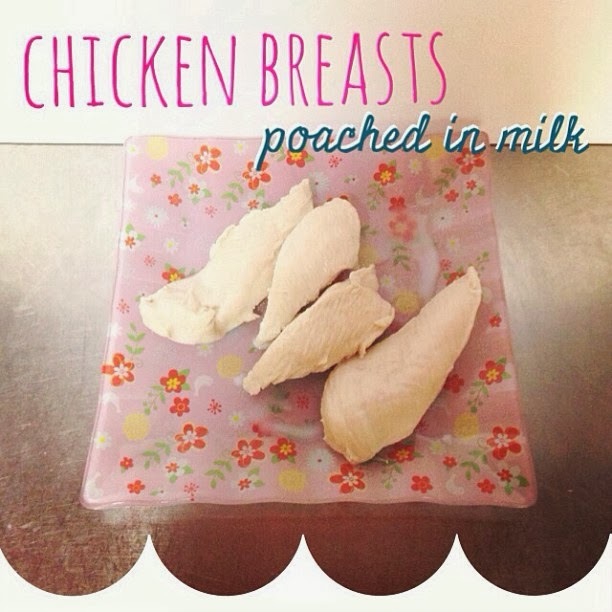 One of the ways that I use fresh milk, is to poach chicken for Kaitlin. I find it a good way to cook chicken breasts so that it's moist and tender, and tasty all at the same time. 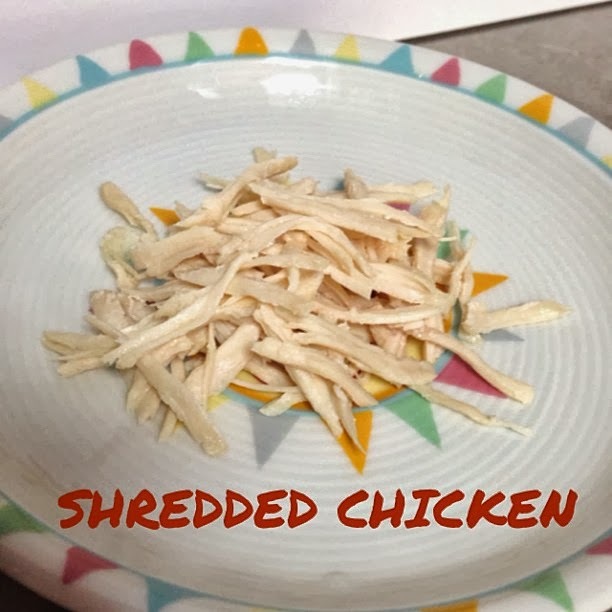 With the poached chicken, I can use it in so many other ways after that to prepare different meals for Kaitlin by shredding or cubing them and then storing them in portions in the freezer. I find it a great way to pack in all the nutrients and doing it this way is such a time saver that I'll be sharing the recipe below. 1. Slice the chicken breast into 3 or 4 equal portions. This step is optional but it will shorten the cooking time. 2. Place the chicken in a pot and pour the milk in such that it almost covers the chicken. 4. Bring the milk to a slight boil and then reduce heat to a simmer such that no bubbles break the surface of the milk. 5. Cover and cook for about 5 minutes. Turn off the heat and leave the chicken to cook for about another 5 minutes. 6. You can use/consume the chicken after that, or leave it to cool for easy slicing/shredding later on. *Tip: Keep the poaching liquid if you are intending to make a soup or cream sauce with/for the chicken as it has quite a fair bit of flavour. So there you go! 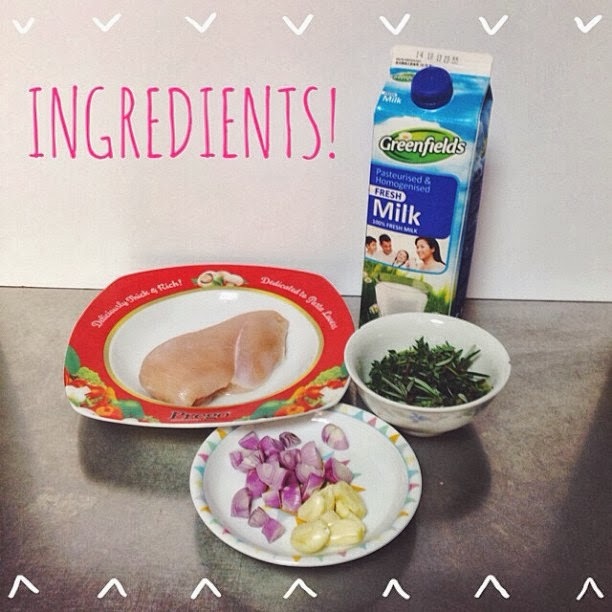 Really simple and easy poached chicken that you can make for the kids or even adults and all you need is pure and honest fresh milk and a couple of other ingredients. 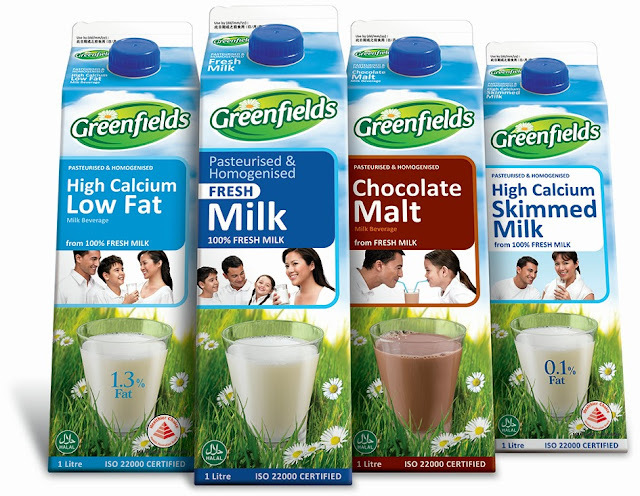 Greenfields Milk comes in variants of Fresh Milk, Chocolate Malt, High Calcium Low Fat and High Calcium Skimmed Milk. Available at most supermarkets at $5.95 for a 2-litre bottle (except at FairPrice for Fresh and Low Fat only), $3.25 for all 1-litre packs and $1.50 for a 200ml pack in 7-11 stores for Fresh and Low Fat only. Disclaimer: This is a sponsored post and I received several cartons of Greenfields Fresh Milk for the purpose of this review. All opinions and views are my own and not influenced by any other external factors.